There was a time when Lutherans would likely feel quite smug regarding the rumors surrounding the Pope and his resignation. Protestants and Roman Catholics have been at odd for centuries, and millions have lost their lives because of the bloodshed between the forces supporting one or the other. Far into the twentieth century, hostility and prejudice continued between the two groups, and traces of it linger still. But times have changed for both Catholics and Lutherans. No longer do we talk about the Pope as the antichrist. * Pope Benedict XVI has even spoken publicly about his deep admiration for Martin Luther and said that Catholics would benefit by being more like him. Whether they are true or not, the damage is done. A wedge has been driven deeper, dividing the Church from the people. The fundamental difference now, from the centuries prior, is the roll of the Church in the daily life of the common man. And by Church (with a capital ‘C’) I am referring to the Communion of all Saints. At no time since 1517, when Luther nailed the 95 theses to the door of the Wittenberg castle church, has the Church been more marginalized by society. Where once the church ruled over every aspect of a person’s life, it is now looked upon as a voluntary club much like the Rotary, or the Lions Club. The Pew Research Center released a study that shows that in the United States, fewer than one out of three persons under thirty belong to any organized religion. The concept of separation of Church and State, a concept unheard prior to Luther, has for many, come to suggest that it is the duty of the government to keep the things associated with Christianity out of the view of those who do not wish to hear its message. Roman Catholics and other Christians find little public support or even understanding in its fight with the Obama administration over the requirement to fund birth control and abortion drugs. As we divisions that make up the Church find ourselves more and more isolated, it is only natural that we would put aside our bickering and embrace those things that we have in common. The Great Commission is not the exclusive to either protestant or catholic, but is the duty of all Christians. So when rumors are broadcast that our fellow Christians have feet of clay, its best that we not throw stones. The Vatican has declared the reports in the newspaper to be unfounded but have stopped short of saying that they (in their entirety) are untrue. It in turn, pointed the finger at those wishing to sway voting in next month’s conclave to elect Pope Benedict XVI’s successor, alluding to political infighting as various parties jockey for position to appoint the next pope. One thing is clear. 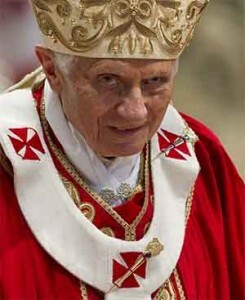 Satan and his angels of darkness are at work in the Vatican stirring up as much trouble as they can. Rumors, innuendo, finger pointing, lies and deceit are all tools of the Great Deceiver. The stories of a homosexual lobby controlling part of the Vatican may, or may not be true. In addition, the stories of financial hanky-panky at the Vatican bank may also be true. Or they may not be. Whether they are true or not, the damage is done. A wedge has been driven deeper, dividing the Church from the people. The seeds of doubt and mistrust are again being sown in the minds of those of weak or dwindling faith. No one but Satan profits from this. While we Lutherans deny the heavenly authority of the Pope, it is in the interest of all Christendom that the next pope be wise, upright, and God fearing. He needs our prayers as well as those of his flock. We pray, therefore, that God guide the cardinals at their upcoming conclave to select a man who is worthy of the office, who will guide his flock wisely, and of course, one who will see things more our way. *It remains official policy of the LCMS that the office of the pope, not any specific pope is an antichrist, thus it can be said THE pope is not the antichrist. Secret Lutheran at Apple or Computer Glitch?